Mosquito bite swelling can be painful and unsightly. In this article, you will discover why mosquito bites swell and how to treat them. You will also learn how long you can expect your bite to stay swollen for. I will also detail the potential causes of persistent mosquito bite swelling. You will learn what to do in the event your mosquito bite does not improve. Why Has My Mosquito Bite Become Swollen? How Long Will a Mosquito Bite Remain Swollen For? How to Treat a Swollen Mosquito Bite? What to Do If Swelling Doesn’t Improve, or Gets Worse? Unlike stinging insects such as wasps, mosquito bites are not venomous. Despite this, the bite of a mosquito can be itchy, irritating and will often swell. There are a few reasons this occurs. Firstly, only female mosquitoes are capable of feeding off blood. Females are also equipped with saliva containing anticoagulants. These substances prevent blood clots from forming while she feeds off the host. The mosquito saliva is responsible for any swelling on or around your bite. This compound is also the cause of the unbearable itching. Once the mosquito saliva is absorbed into your skin, your immune system will react. 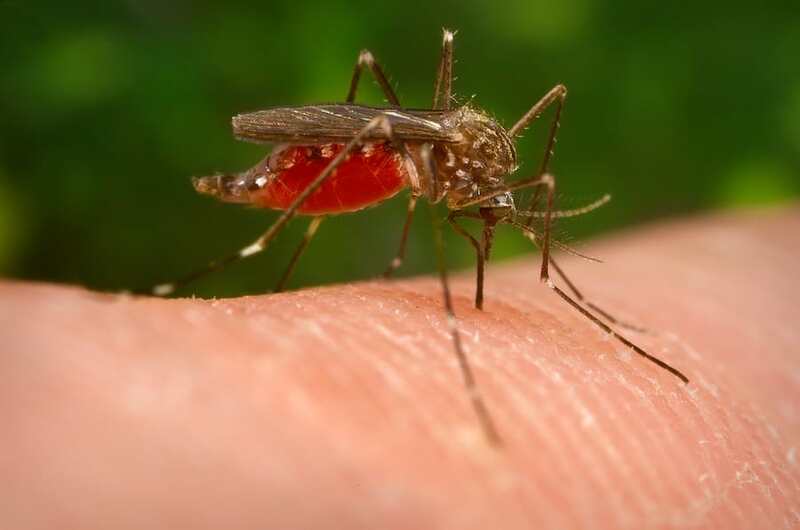 Your body will release Immunoglobulin E (IgE) antibodies to the site of the mosquito bite. Not everyone will experience the same level of swelling or even itchiness. As with the majority of insect bites, your reaction can range from mild to severe. This will depend on your personal sensitivity to mosquito saliva. The more fortunate could have reactions so minor they may not even realize a mosquito has bitten them. A study took blood samples from subjects living in a mosquito-infested area. When bitten by mosquitoes, these people produced so-called “anti-saliva” antibodies. This was because they had developed a tolerance to the bites over time. Usually, mosquito bites present as small, red bumps that itch. If your mosquito bite is swollen, you may be experiencing an allergic reaction. Swelling can manifest in several ways. You may develop raised welts that are much larger than the “average” mosquito bite. More serious reactions can include blistering and hives. There is no set time for how long your bite will stay swollen for. As with the severity of the swelling, it depends on your individual sensitivity. Treating the bite can also shorten the duration of the swelling. The average mosquito bite will disappear after several days at the most. Welts, hives, and blisters can take more time to disappear completely. Mishandling the bites increases the likelihood that they will remain swollen. For this reason, it is better not to scratch or pick at them. Taking prompt action after you notice a bite can reduce swelling and promote healing. Most importantly, scratching should be avoided at all costs. A swollen bite means you are already sensitive to mosquito saliva. Scratching the bite can thus increase swelling, and carries a risk of infection. You can unintentionally transfer bacteria from your skin’s surface into the bite. This can result in a secondary infection. If your bites have manifested as blisters, popping them is unwise. You will expose your raw skin to bacteria in the air and increase your chances of developing an infection. Scratching may feel good in the short term, but will cause you more pain in the long run. You should also refrain from pressing or picking at hives and welts, for the same reason. Before treating the bite, wash it first. This can help rinse away any irritating mosquito saliva and lower infection risk. You can use a gentle antiseptic soap and warm water. Take particular care when washing blisters and hives. Aggressive scrubbing can be painful and worsen the swelling, itching, and pain. Applying ice or a cool washcloth can temporarily relieve swelling. This can also soothe bite pain and itching. A swollen mosquito bite can cause discomfort. This is especially true if you have multiple bites or a more severe form of swelling, such as hives. Take an over-the-counter painkiller as per the medication’s instructions, to alleviate pain. If your child has swollen mosquito bites, make sure the painkiller is child-safe. Aspirin is not appropriate for children under 16 years old. The next step is combating the inflammation that is causing the bite to swell. Antihistamines are drugs that are designed for treating allergic reactions. They are often used for insect bite reactions and can be bought without a prescription. There are various types of antihistamines. These medications come in different forms, from tablets to ointments. Loratadine is an antihistamine that is often recommended for mosquito bites. It can soothe itching and reduce swelling rapidly. Loratadine can be taken by both adults and children. This antihistamine is effective for controlling delayed bite reactions. If your mosquito bites tend to swell up gradually, taking Loratadine can prevent this from happening. If your swelling is more severe, you can try topical hydrocortisone. These are ointments, gels, and creams containing the steroid hydrocortisone. You can buy these at your local pharmacy. With the aforementioned treatments, your bite should begin to heal after several days. Pain and swelling will decrease and the bite’s overall appearance should improve. A persistently swollen bite should be taken seriously. Schedule an appointment with a doctor if your bite is getting worse. You might have developed a secondary infection. Other symptoms can include redness, increased pain, and discharge. If the infection has advanced, you may need antibiotics to fight it. Occasionally, mosquito bites can provoke severe allergic reactions. Over-the-counter treatments may not work to reduce swelling in these cases. You might require something stronger. Your doctor may recommend a short course of prescription steroids to reduce inflammation. Unrelieved swelling can also be a sign of a potentially serious condition. Skeeter’s syndrome is an extreme reaction to mosquito bites. This disorder manifests similarly to a secondary infection. Aside from swelling, the bite can feel warm to the touch. The skin surrounding the bite may turn red and become sensitive or painful. You may also develop a low-grade fever, nausea, and vomiting. If you suspect you or your child has Skeeter’s syndrome, seek immediate medical attention. Anaphylaxis is an allergic reaction that affects your entire body. Fortunately, it is rare in response to mosquito bites. Nonetheless, you should still be aware of the symptoms to look out for. With insect bites, anaphylaxis can occur right after you are bitten. In other cases, the reaction can take time to manifest. One of the symptoms is increased swelling of the bite or sudden development of hives. If you experience difficulty breathing, vomiting, or abdominal pain seek urgent medical attention. Anaphylaxis can result in fatal complications if untreated. If you have previously suffered an anaphylactic response to a mosquito bite, it could happen again. Your doctor will suggest you carry an epinephrine pen on your person in the event of future bites. Epinephrine can halt anaphylaxis or slow symptoms until you reach help. Mosquitoes are known agents of disease. The mosquitoes that spread certain pathogens can be found throughout the world. There are several symptoms you should look out after being bitten by a mosquito. These can include fever, gastric distress, and a skin rash. Find out if you are in a region that has populations of disease-carrying mosquitoes. You can check this with your local public health department. Preventing mosquito bites is the best solution. Use an insect repellent if you are going to be spending a lot of time outdoors. Certain areas, such as bodies of standing water, are breeding grounds for mosquitoes. Avoid such locations if possible. Keeping your bites clean and applying the appropriate medication will help them heal faster. You should also do your best not to scratch the bites. Do not ignore your bite if the swelling becomes worse or you begin suffering from other symptoms. Mosquito bite swelling can be easily treatable, or could be a sign of something more serious.